2000 Bagby #9420 is a contemporary two story, two bedroom, two full bathroom condo located on the ninth floor of Midtown's Rise Lofts. This jewel of a unit is located just above the tree-line, offering spectacular views, while the complex offers amenities such as an infinity pool, a zen garden, an outdoor terrace, and social areas! 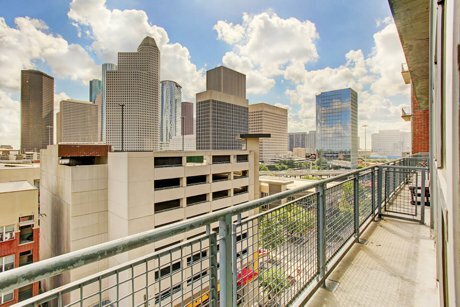 Great Midtown location with a fantastic view of the Downtown skyline from the ninth floor. Polished concrete floors on the first floor of the unit, carpet on the second. Open floor plan kitchen, dining, and living areas on the first floor of the unit. Island kitchen with dark oak cabinets, stainless appliances, granite counters, and breakfast bar seating. Twenty-foot windows in the living area provide a spectacular view. Balcony off of the living room as well. Perfect space for a study or game room on the loft overlooking living room. Carpeted master bedroom suite tucked behind the game room/study area by sliding doors. Spacious. Master bathroom features double porcelain sinks, granite counters, vanity cabinets, extra-deep soaking tub and a separate double shower. Secondary bedroom with polished concrete floors, built-in closets, and an en suite bathroom. Bathroom has a glass-walled shower, marble counters, and hallway access. Wonderful building amenities such as a rooftop infinity pool and hot tub/spa, outdoor terrace, and zen garden. Great proximity to popular shops, restaurants, and clubs. Zoned to Gregory-Lincoln Elementary School, Gregory-Lincoln Middle School, and Heights High School. Please check availability. >More Great Homes For Sale in Midtown!